The best thing about Web 2.0 is that… nobody knows what the hell it really means. Even the ones who coined the term are still struggling to find a compact definition. And this is the true beauty and power of Web 2.0—it makes people think. Not only does virtually nobody know what it really means, but we don't even know what it does NOT mean—Jason Fried blogged about The Top 10 Things that aren't Web 2.0 and as of today, that post has 88 comments. Yes, 88 comments arguing and debating almost Hot or Not style about whether something is or is NOT Web 2.0. And anything that gets this many people talking, arguing, debating, and most importantly—thinking—is a really good thing. An amazing thing. Because each time someone fires a single neuron deciding whether there even is such a thing as Web 2.0 or whether it's just all marketing hype, is a moment in which that person gains knowledge and understanding. Not because someone shoved a perfect, high-resolution definition down their throat, but because the person was virtually forced into figuring it out for themselves. Real knowledge and understanding is the product of a co-creation. A joint effort between a brain and... something else. That something else can come in many forms—experimentation, conversation, studying, reading, synthesizing, etc. And some of the deepest, richest opportunties for new knowledge co-creation are those forced on our brains by low-resolution but compelling ideas, pictures, and concepts. And Web 2.0 has to be one of the most thought-provoking memes in recent history. 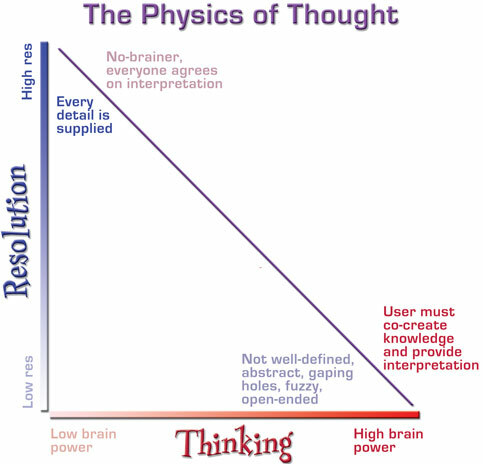 Thinking has an absolute value all by itself, even if the thought provoked is simply "That's complete and utter crap!" If you're trying to help someone learn, inspire them, motivate them, engage them, involve them, or just get some kind of a reaction beyond mental and emotional flatline, turn down the gain in strategic places. Good teachers, filmmakers, novelists, advertisers, and storytellers know this. It is part of what makes cartoons so compelling. In the classic (must must must read) Understanding Comics, Scott McCloud suggests that the more abstract (as opposed to photorealistic) nature of cartoons allows the viewer to identify with the character. An abstract, iconic face could be... almost anyone. But as photorealism increases, the likelihood of the user seeing himself in the character decreases. A cartoon happy face could be me. A photoreal image of a 25-year old male with cropped hair, a beard, and a pierced nose is clearly not. But it's not just about whether you can imagine yourself as the character. In novels, for example, even with fairly explicit descriptions of the characters, our brains can't help but supply the details. We literally create the characters in our minds, and that's a big part of what keeps us engaged. Advertisers use this notion of low-resolution with tricks as simple as using black and white (or very desaturated colors) rather than full vibrant for a sensual print or television ad. When the ad is full-color, high res, our brains can just kick back. But when the image is missing information, such as color, our brains can more easily become sucked into the image, supplying the pieces. Filling in the blanks. Filmmakers use this in everything from cinematography to whether the ending is fully resolved. I saw A History of Violence last week, and walked out with the rest of the audience talking about what the ending meant, and speculating on what happened next. Clearly nothing happened next…the story was over! But our brains couldn't help spinning out scenarios and filling in the things that weren't said at the ending. Had they given the movie a nice Hollywood style ending, where everything is wrapped up complete with a bow, we would have left the theater satisfied, but with nothing left to think about (unless the film left other holes). Good teachers use this—they leave holes. They ask learners to fill in the blanks. They use a smackdown learning model that forces learners to choose between multiple and potentially conflicting points of view. They don't lead users step-by-step down a carefully crafted, everything is supplied path. They send them out to explore, possibly even nudging them down a garden path that will lead to surprises (including failures) they never expected. Many of us tend to think that more is more. That the more detail we provide, the better it is for our users and learners. Sometimes that's true, especially with reference material. But if you're trying to get people to learn, think, remember, engage, understand, grow... less is better. Strategically removed, hidden, or temporarily withheld content can mean the difference between passive, surface learning and involvement and deep, lasting, understanding. Our brains are wired to fill s*** in. That's what they do, and they can scarcely help it. Mind Hacks is loaded with examples of ways in which our brains supply missing information, often without our conscious awareness. But you can use this to your advantage when you're trying to get someone involved, and especially when you want them to learn. Yes there's a huge danger that if you're not careful and strategic you'll just piss people off. Witholding content to help draw the user's brain in is certainly risky, and doesn't belong in places like, say, technical specs or some aspects of an interface. And Tim O'Reilly has certainly taken the heat for the whole Web 2.0 thing. But he's gotten more people talking, thinking, and even creating new things as a result. Had the Web 2.0 meme come down as a perfectly defined, high-resolution description with no room for user interpretation, it would have been far weaker. As it stands, Web 2.0 can never be said to mean absolutely nothing, because the brain power it takes someone to reach that conclusion had value. Great post. I definitely agree that providing too many details hinders learning and creativity, and in short, makes readers/users lazy. However, balance is vitally important. If you go too far - providing not enough information - the reader will be confused, and what you are trying to say will not be communicated properly. I think the term "Web 2.0" is too abstract. For example, whenever I read the term Web 2.0 in an article, I am confused and annoyed because I do not know the author's interpretation of the term. No matter how much thinking I do, I can never grasp the concept the author is trying to communicate unless he provides further details. While it might be great to use meaningless language for education, it's not helpful when you want to actually do something. When government leaders started arguing about who was in charge of disaster relief after hurricane Katrina, I didn't notice a lot of people saying "It's great that this is stimulating so much thought about how government works." "After all, many of us would kill to get this many people thinking and talking." I tend to read things more literally than most people. But I think you might want to be a bit more careful with your word choice. I've always thought that it was sufficient to define Web 2.0 as a shift away from static web pages and towards dynamic, largely user generated content created via web services. The permutations and possiblities of that are huge, but it doesn't really seem that complicated to me. Re your graphic above, aren't tagging, AJAX and collective intelligence all aspects of web services? no one knows what "sdhcbaidesfhwa q3f84ur 9840932" means -- but does that make "sdhcbaidesfhwa q3f84ur 9840932" a useful concept? or not? "If you're trying to help someone learn...turn down the gain in strategic places." I'm assuming that most people realize I'm not talking about random meaninglessness. The point is to *invite* brains to become involved, by design. No, this is no about meaninglessness. If I didn't make that clear enough, I'll have to work on that. And Scott: I completely appreciate what your saying, but again, the *context* in which this make-em-think technique is employed matters deeply. As for "kill", well, I'm quite likely to use figures of speech... and again, I assume most people will understand the context. When I say, "I'd kill for some Ben & Jerry's right now..." I'm thinking ice-cream fix, not felony. But your point is not lost, and in the right context I would agree. "The point is to *invite* brains to become involved." The point is to *confuse* brains to become crazy. As for the random text, I think the numbers in the TV show Lost are a good example of that. They could have just inserted random numbers in there, but I don't even watch the show and enough people have talked about it to bore me. But I still think celebrating meaninglessness is a bad thing. If only certain contexts make ambiguity helpful, this is not one of those contexts. It would be more helpful and interesting to discuss how those contexts are bounded than to broadly promote confusion with a fine print disclaimer at (or past) the end. I've read Scott McCloud's understanding comics, but I've never thought about it in that way... Hmmm. I think I'm gonna apply it on my blog. Best of Web 2.0 sites ranked by actual users. Drag & drop sites to desired spot in the list and submit rankings. Overall rankings reflect cumulative average of all user submissions. Recommend a new site as well..